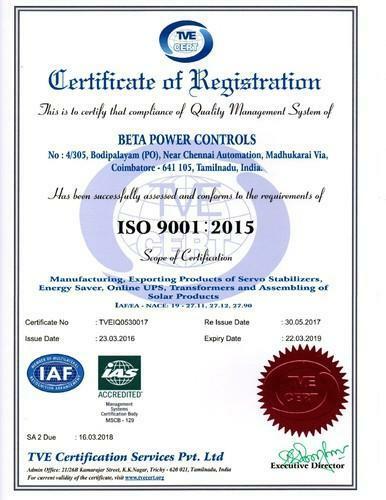 Established in 2007 with a corporate objective to provide efficient energy for greener future, Beta power controls has grown to be one of the country’s biggest manufacturers of power saving and power conditioning equipment with the largest satisfied customer base. The products manufactured by us have made a distinct place in the market owing to their features like excellent performance, longer lifespan and less power consumption. With an objective to manufacture quality products, our experts use the latest equipment and best quality raw material provided by our trusted vendors of the market. The customer can also avail these products in customized range as per their requirement and market-leading prices. Beta power has over 30+ employees. It has manufacturing facilities as well as distribution and service Centers across India. Our organization has established a state-of-the-art infrastructure facility for having hassle-free execution of all the production related activities. The manufacturing unit of our firm is equipped with varied essential machinery due to which, we are capable of meeting the voluminous requirements of the patrons within the stipulated time-frame. All our machines are regularly upgraded and lubricated, so as to retain an excellent production rate. Further, to manage and control all the activities that take place within our premises, we have appointed a team of deft personnel. With an objective of efficient and scheduled working, we have divided our infrastructure into various departments like manufacturing unit, quality control department, research and development wing and administrative department. With an objective aim to have an organized and systematic execution of all the research-related activities of our firm, we have maintained a specific Research and Development department. This department is equipped with the latest technology and modern equipment that are essential for carrying out various research activities. Moreover, we have hired a team of innovative Research & Development experts to manage and control all the tasks of this unit. These experts conduct variegated extensive researches with the objective of enhancing the quality and features of our existing product range. They also conduct various market surveys and researches to know the exact needs and expectations of the patrons. Further, our researchers always keep themselves updated with the advancements in the field of technology and suggest the necessary changes to the manufacturing department.